Bacterial infections causing acute exacerbations of chronic obstructive pulmonary disease (AECOPD) frequently require antibacterial treatment. More evidence is needed to guide antibiotic choice. The Moxifloxacin in Acute Exacerbations of Chronic Bronchitis TriaL (MAESTRAL) was a multiregional, randomised, double-blind non-inferiority outpatient study. Patients were aged ≥60 yrs, with an Anthonisen type I exacerbation, a forced expiratory volume in 1 s <60% predicted and two or more exacerbations in the last year. Following stratification by steroid use patients received moxifloxacin 400 mg p.o. q.d. (5 days) or amoxicillin/clavulanic acid 875/125 mg p.o. b.i.d. (7 days). The primary end-point was clinical failure 8 weeks post-therapy in the per protocol population. Moxifloxacin was noninferior to amoxicillin/clavulanic acid at the primary end-point (111 (20.6%) out of 538, versus 114 (22.0%) out of 518, respectively; 95% CI -5.89–3.83%). In patients with confirmed bacterial AECOPD, moxifloxacin led to significantly lower clinical failure rates than amoxicillin/clavulanic acid (in the intent-to-treat with pathogens, 62 (19.0%) out of 327 versus 85 (25.4%) out of 335, respectively; p=0.016). Confirmed bacterial eradication at end of therapy was associated with higher clinical cure rates at 8 weeks post-therapy overall (p=0.0014) and for moxifloxacin (p=0.003). Patients treated with oral corticosteroids had more severe disease and higher failure rates. The MAESTRAL study showed that moxifloxacin was as effective as amoxicillin/clavulanic acid in the treatment of outpatients with AECOPD. Both therapies were well tolerated. Acute exacerbations of chronic obstructive pulmonary disease (AECOPD), which are usually associated with chronic bronchitis, cause substantial morbidity, mortality and a marked reduction in quality of life [1–4], placing a significant burden on both patients and healthcare systems [5–7]. Frequent exacerbations result in a more rapid reduction in lung function, with even single episodes having a prolonged negative effect on health status [8, 9]. One factor that may result in high relapse rates is persistent bacterial infection . Few trials show clinical or bacteriological superiority of one antibiotic over another in acute exacerbations of chronic bronchitis (AECB) or AECOPD, possibly due to issues of sample size, patient selection and end-point definition . Many clinical studies have enrolled highly heterogeneous patient populations in terms of age, comorbidities and, importantly, disease severity . Current treatment guidelines recommend antibiotic therapy for patients with a more severe illness [13–15] and often use acute symptom changes based on Anthonisen criteria of type I (worsening dyspnoea with increased sputum volume and purulence) or II (change in any two of these symptoms) exacerbations to define this group. Patients with such exacerbations are most likely to benefit from antibiotics, suggesting a bacterial aetiology . Inclusion in trials of patients with type III exacerbations (change in any one symptom) and those with mild COPD may distort the true effect of antibiotics as such patients are likely to experience recovery without an antimicrobial. Most clinical trials have focussed on short-term clinical efficacy with test of cure being a few days or weeks after the end of treatment. However, as the time course of recovery can be lengthy , and as some patients remain at risk of further exacerbations for several weeks after treatment [18, 19], monitoring patients over this prolonged period may provide a more accurate picture of the true efficacy of an antibiotic therapy. It is likely that a rapid relapse relates to incomplete resolution of the previous exacerbation rather than a second new exacerbation. Comparing a large group of patients with moderate-to-severe COPD treated with moxifloxacin or amoxicillin/clavulanic acid, the two treatments recommended in this group [14, 15], at a novel 8-week end-point, may help identify patients that could benefit from one or other antibiotic. The choice of an 8-week time-point captures relapses that are probably related to the management of the initial exacerbation, but is not so long that other events, such as antibiotic treatment of a nonrespiratory condition, make the interpretation of results difficult. The primary objective of the MAESTRAL (Moxifloxacin in Acute Exacerabations of Chronic BronchitiS Trial) was to compare the efficacy of a 5-day course of moxifloxacin to that of a 7-day course of amoxicillin/clavulanic acid in the treatment of outpatients with chronic bronchitis experiencing AECOPD who are at high risk of treatment failure. MAESTRAL may provide information that supports current guidelines and recommendations in terms of which treatments are the most appropriate for specific patient groups, in particular those with confirmed bacterial infections, as well as further evidence regarding the most appropriate study design for trials of antibiotics in outpatients with AECB/AECOPD. Full details of the complete study design have been published previously . MAESTRAL was a prospective, multinational, multicentre, randomised, double-blind, double-dummy controlled, non-inferiority study that compared the efficacy of 5 days of moxifloxacin 400 mg p.o. q.d. with 7 days of amoxicillin/clavulanic acid 875/125 mg p.o. b.i.d. as a first therapy in outpatients experiencing an AECOPD. The dose of amoxicillin/clavulanic acid was selected based on the most commonly used dose, recommendations in treatment guidelines and data showing the equal efficacy but improved tolerability profile of the 875/125 mg b.i.d. dose versus the 500/125 mg t.i.d. dose . Prior to randomisation, patients were stratified based on the concomitant administration of a short course of oral steroids, prescribed at the treating physician's discretion (see online supplementary material for full details). Compliance was assessed via collection of empty and/or unused packets of the study drug at the end of therapy (EOT) or the premature discontinuation visit. All patients provided written informed consent and the study was carried out according to relevant ethical and Good Clinical Practice Guidelines . Full inclusion and exclusion criteria are given in the online supplementary material. In brief, outpatients with moderate-to-severe COPD  and chronic bronchitis suffering from an investigator-evaluated Anthonisen type I exacerbation and who were considered by the investigator to require antibiotic therapy were enrolled. Patients were ≥60 yrs of age with a documented history of two or more exacerbations within the previous year requiring a course of systemic antibiotics and/or systemic corticosteroids and were current or past cigarette smokers (≥20-pack-yr smoking history). At enrolment, all patients had a post-bronchodilator forced expiratory volume in 1 s (FEV1) ≤60% predicted, with FEV1/forced vital capacity <70%. Spontaneous sputum samples were obtained from all patients and assessed in a local laboratory by culturing and Gram staining. The first sputum sample was collected at the enrolment visit, with “first-morning” samples preferred for subsequent visits. Investigators carried out macroscopic quality assessments of all samples and neutrophil levels were assessed semi-quantitatively. Pre-specified potentially pathogenic bacteria (Streptococcus pneumoniae, Moraxella catarrhalis, Pseudomonas aeruginosa, Haemophilus spp., Enterobacteriaceae spp. and Staphylococcus aureus) were identified. Full details of susceptibility testing  are given in the online supplementary material. The primary efficacy end-point of MAESTRAL was clinical failure by the 8-week post-therapy visit. Clinical failure was defined as the requirement for additional or alternate treatment with systemic antibiotics and/or systemic corticosteroids (including increased dose or duration of treatment), and/or hospitalisation prior to the 8-week post-therapy visit for an exacerbation of respiratory symptoms. Prior to unblinding, an independent Data Review Committee, which consisted of R. Wilson, A. Anzueto, M. Miravitlles and S. Sethi, assessed the data for all patients who were clinical failures or had indeterminate assessments in order to confirm the primary clinical outcome. Secondary end-points included clinical response in patients with positive sputum cultures and bacteriological outcomes. A full list is available in the online supplementary material. The statistical analysis plan, including definitions of clinical and bacteriological responses, is reported by Wilson et al. and is included in the online supplementary material. The primary aim of the study was to show noninferiority (defined as a difference in failure rates of ≤6% using a one-sided test at a level of 2.5%) of moxifloxacin versus amoxicillin/clavulanic acid in the per protocol (PP) population. Figure 1 shows definitions of populations. If noninferiority was statistically proven, the possibility that moxifloxacin is superior to amoxicillin/clavulanic acid was tested in the intent-to-treat (ITT) population, using a one-sided test at the 2.5% level. The primary ITT analysis was clinical failure versus all other evaluations (clinical cure, indeterminate and missing). Two sensitivity analyses in the ITT population are outlined in the online supplementary material. Efficacy outcomes in bacteriologically positive patients were assessed in the PP and ITT with pathogens populations. Other secondary clinical end-points were analysed using appropriate patient populations and time-points (see online supplementary material). There was no alpha level adjustment for the secondary efficacy variables or the subgroup comparisons that were carried out. All safety events were assessed by the investigator based on the clinical investigation and patient interview. All patients were required to record any symptoms indicative of an adverse event, which were then scrutinised by the investigator. All events were assessed by the investigator for relatedness to the study drugs. Definitions for the populations involved in the study. Patients could be excluded for more than one reason. Intent-to-treat (ITT)/safety population, these randomised patients received at least one dose of the study drug and had one observation after initiation of the study treatment. ITT with pathogens population: patients valid for ITT with a minimum of one pre-therapy potentially pathogenic bacterium. Per protocol (PP) population (primary anaylsis population), patients with an acute exacerbation at enrolment who received the study drug for a minimum of 48 h (cases of clinical failure) or received ≥80% of the study medication (cases of clinical cure). All PP population had data for clinical evaluation at 8 weeks post-therapy (except for clinical failures prior to the 8-week post-therapy visit) and had no protocol violations. PP with pathogens population: these patients were drawn from the PP population and had a minimum of one potentially pathogenic bacterium cultured from the sputum they provided prior to start of therapy and where a bacteriological evaluation was available during the study. GCP: Good Clinical Practice; #: data taken from one site (n=9 patients in total) judged to be unreliable and excluded from analysis; ¶: the majority of patients with essential data missing or invalid were either lost to follow-up or consent was withdrawn (58 and 56% for moxifloxacin and amoxicillin/clavulanic acid, respectively). A total of 1,492 patients from 30 countries were enrolled in the study, of whom 1,372 were randomised and 1,056 were valid (PP) for the primary efficacy analysis (20 were excluded from the ITT population), (fig. 1). Reasons for exclusion from the PP population (moxifloxacin n=139, amoxicillin/clavulanic acid n=157) were similar for both of the treatment groups, the most common being violation of inclusion/exclusion criteria, clinical responses of indeterminate and patients lost to follow-up. Criteria violations leading to exclusion are listed in the online supplementary material. Patient characteristics at baseline are shown in table 1 and were similar between treatment groups: the majority of patients were Caucasian males of ≥65 yrs of age with moderate-to-severe airway obstruction. A majority of patients in each group had comorbid conditions (moxifloxacin 78%, amoxicillin/clavulanic acid 81%) and were receiving maintenance therapy for their COPD (table 1). Further details of the most frequent comorbid conditions are listed in the online supplementary material. No marked differences in patient characteristics were seen between the ITT and PP populations. A total of 371 (35.1%) PP patients received concomitant steroid therapy (moxifloxacin n=182, amoxicillin/clavulanic acid n=189) with steroid use varying by region (Asia/Pacific, 92 (28.6%) out of 322; Europe, 130 (34.7%) out of 375; South Africa 17 (48.6%) out of 35; Latin America, 131 (42.3%) out of 310; Canada, one (7.1%) out of 14). Compared with the nonsteroid group, these steroid-treated patients had a mean lower FEV1 % pred at enrolment (mean±sd overall: 36.8±11.4 versus 39.2±11.4, steroid- versus nonsteroid-treated patients, respectively; p<0.0001) and a higher proportion of patients had a FEV1 <30% pred (overall 29.9 versus 22.9% pred, p=0.017). We conducted retrospective analyses (shown in the online supplementary material) that indicated steroid-treated patients had a longer past history of respiratory disease, more cough and wheeze at baseline, were more breathless with tachypnoea and tachycardia, and had worse scores on Acute Exacerbation of Chronic Bronchitis Symptom Score (AECB-SS) health status questionnaires. Moxifloxacin was noninferior to amoxicillin/clavulanic acid with respect to clinical failure rates at 8 weeks post-therapy in the PP population (20.6 versus 22.0%, respectively; 95% CI -5.89–3.83%; table 2). The analysis of the ITT population also demonstrated non-inferiority (95% CI -5.50–3.03) but did not demonstrate superiority (table 2). Clinical failure rates in patients with bacteria isolated at baseline were significantly lower in moxifloxacin versus amoxicillin/clavulanic acid-treated patients, showing a treatment difference of ∼6% in favour of moxifloxacin in both the PP with pathogens (50 (19.2%) out of 260 versus 68 (26.1%) out of 261, moxifloxacin versus amoxicillin/clavulanic acid, respectively; 90% CI −15.0– −0.75; p=0.030) and ITT with pathogens populations (62 out of 327 (19.0%) versus 85 (25.4%) out of 335; 95% CI −13.9– −1.44; p=0.016) (table 2). In patients without bacteria isolated at baseline, clinical failure rates were similar between treatment groups (moxifloxacin, 76 (21.7%) out of 350, amoxicillin/clavulanic acid 61 (17.9%) out of 340; p=0.120). In the ITT population, time to clinical failure was similar in both treatment arms (fig. 2a). In the ITT with pathogens population, time to clinical failure was significantly longer for moxifloxacin versus amoxicillin/clavulanic acid (fig. 2b, p=0.015). Failure rates were similar at EOT (moxifloxacin 27 (8.3%) out of 327 versus amoxicillin/clavulanic acid 33 (9.9%) out of 335), with an increasing divergence in favour of moxifloxacin at 4 weeks post-therapy (44 (13.5%) out of 327 versus 64 (19.1%) out of 335, respectively) and 8 weeks post-therapy (62 (19.0%) out of 327, versus 85 (25.4%) out of 335, respectively). Kaplan–Meier curves of time to clinical failure/relapse. In all analysis populations, clinical failure rates at 8 weeks post-therapy were higher in steroid- versus nonsteroid-treated patients in both treatment arms (fig. 3). In steroid-treated patients, a nonsignificant trend for lower failure rates in favour of moxifloxacin was observed. This effect was most notable in the patients testing positive for bacteriological cultures (fig. 3b). Clinical failure rates at 8 weeks post-therapy. PP: per protocol; ITT: intent-to-treat. No significant differences were seen in moxifloxacin and amoxicillin/clavulanic acid clinical failure rates between various subgroups (e.g. patients ≥65 yrs of age and number of previous exacerbations), as shown in the online supplementary material. A total of 662 (49.0%) ITT patients had causative organisms isolated from sputum at baseline. The most common pathogens in both arms were Haemophilus influenzae (21.1%) followed by P. aeruginosa (16.8%) and Klebsiella pneumoniae (12.7%). S. pneumoniae and M. catarrhalis were also present in ≥10% of patients in each arm (table 3). The majority of isolated pathogens, except for P. aeruginosa, were susceptible to both drugs at baseline (see online supplementary material). In a retrospective comparison of patient characteristics for those with or without pathogens at baseline (table 4), there were significantly more patients in the microbiologically positive group who were either aged >65 years, had an FEV1 ≥30% pred or who had not used antibiotics in the prior 3 months. For the overall analysis of bacterial efficacy, eradication rates (presumed and confirmed eradications) in the PP and ITT with pathogens populations were higher for moxifloxacin versus amoxicillin/clavulanic acid (PP 70.4 versus 64.4%, respectively, p=0.078; ITT 66.0 versus 58.8%, respectively, p=0.026,) at EOT (table 3). Eradication rates were higher in the moxifloxacin arm during therapy, although converged with those of amoxicillin/clavulanic acid towards 8 weeks. In the ITT with pathogens population, eradication rates during therapy for moxifloxacin and amoxicillin/clavulanic acid, were 231 (70.6%) out of 327 and 196 (58.5%) out of 335, respectively (p=0.0004). At 4 weeks post-therapy, the eradication rates were 196 (59.9%) out of 327 and 193 (57.6%) out of 335 (p=0.35) for moxifloxacin and amoxicillin/clavulanic acid, respectively, while at 8 weeks post-therapy they were 194 (59.3%) out of 327 and 183 (54.6%) out of 335 (p=0.088), respectively. Similar results were seen in the PP with pathogens population (data not shown). Individual pathogen eradication rates at EOT are shown in table 3. Development of resistance or increase in minimum inhibitory concentration (MIC) was rare and from a population viewpoint seemed to have no impact on the persistence of the isolate (data not shown). Overall, eradication rates at EOT were similar between steroid and nonsteroid users (150 (61.2%) out of 245 versus 263 (63.1%) out of 417, p=0.655) in the ITT with pathogens population. There was no difference between the two antibiotics at EOT in bacteriological eradication rates in steroid-treated patients (moxifloxacin 77 (61.1%) out of 126, amoxicillin/clavulanic acid 73 (61.3%) out of 119); however, in nonsteroid-treated patients eradication rates were higher for moxifloxacin than amoxicillin/clavulanic acid (139 (69.2%) out of 201 versus 124 (57.4%) out of 216, respectively; p=0.001). In the overall ITT with pathogens population, clinical cure rates at 8 weeks were higher in patients with confirmed or presumed eradication (329 (79.7%) out of 413) versus those with persistence, presumed persistence or superinfection at EOT (123 (54.7%) out of 225, p<0.0001). Similar results were seen within each treatment group (moxifloxacin 182 (84.3%) out of 216 versus 55 (53.4%) out of 103, p<0.0001; amoxicillin/clavulanic acid, 147 (74.6%) out of 197 versus 68 (55.7%) out of 122, p=0.0007). When considering patients with confirmed bacterial eradication at EOT, clinical cure rates were significantly higher at 8 weeks post-therapy than those with confirmed bacterial persistence or superinfection (149 (76.8%) out of 194 versus 123 (62.1%) out of 198, p=0.0014). In the moxifloxacin arm, 86 (80.4%) out of 107 patients with confirmed eradication at EOT had a clinical cure at 8 weeks, compared with 55 (61.1%) out of 90 who had persistence/superinfection (p=0.003). In the amoxicillin/clavulanic acid arm, 63 (72.4%) out of 87 patients with confirmed eradication had a clinical cure at 8 weeks, versus 68 (63.0%) out of 108 who had persistence/superinfection (p=0.150). In both treatment arms of the ITT population, absolute FEV1 improved significantly from enrolment (moxifloxacin 0.982 L, amoxicillin/clavulanic acid 0.969 L) to 8 weeks post-therapy (moxifloxacin 1.216 L, amoxicillin/clavulanic acid 1.150 L; p<0.0001 for both arms of the study). There was a trend for greater improvements at all time-points in the moxifloxacin versus the amoxicillin/clavulanic acid arm for both changes in absolute (0.207 versus 0.177 L, respectively) and FEV1% pred (8.13 versus 7.07, respectively; see online supplementary material). A gradual, but marked, improvement was observed in the St George's Respiratory Questionnaire (SGRQ) scores in both treatment arms from baseline to 8 weeks post-therapy. No significant differences were seen between the treatment arms at the primary end-point (moxifloxacin -20.5, amoxicillin/clavulanic acid -20.4). Mean changes in AECB-SS scores at 8 weeks post-therapy (moxifloxacin -1.36, amoxicillin/clavulanic acid -1.42) did not differ between treatments (see online supplementary material). Both treatments were equally well tolerated, with no unexpected adverse events observed in either arm. A total of 220 moxifloxacin-treated patients and 218 amoxicillin/clavulanic acid-treated patients experienced an adverse event (table 5) with 1.8 and 1.3% of patients, respectively, prematurely discontinuing treatment due to an adverse event. The most commonly occurring drug-related adverse events are shown in table 5; gastrointestinal-related events were most frequently reported, although occurred in <2% of patients in either arm. In the amoxicillin/clavulanic acid arm there was one report of a Clostridium difficile-related disease and one of C. difficile/pseudomembranous colitis. Serious drug-related adverse events were rare: in the moxifloxacin arm, four patients experienced one event each (anaphylactic reaction, bronchitis, gastroenteritis and tachyarrhythmia) while in the amoxicillin/clavulanic acid arm, two patients each experienced one event (allergic dermatitis and radial nerve palsy). The tachyarrhythmia occurred in an elderly (74 yrs of age) female and resolved with adjunctive therapy; the study drug treatment was not discontinued. There were three adverse event-related deaths in each arm but none were considered to be treatment related. All-cause hospitalisation rates were similar across both arms of the study for the ITT population (41 (6.1%) out of 677 and 47 (7.0%) out of 675 for moxifloxacin and amoxicillin/clavulanic acid, respectively; p=0.48). The MAESTRAL study met its primary end-point and demonstrated the noninferiority of moxifloxacin to amoxicillin/clavulanic acid in the treatment of exacerbations of moderate-to-severe COPD. Moxifloxacin was superior to amoxicillin/clavulanic acid with respect to reducing clinical failure rates at the 8-week time-point in patients with a bacteriologically confirmed exacerbation. At the EOT visit the overall bacterial eradication rate was significantly higher for moxifloxacin than for amoxicillin/clavulanic acid. Higher bacteriological efficacy for moxifloxacin versus amoxicillin/clavulanic acid was due to H. influenzae, the most common pathogen. There was a significant relationship between the bacterial eradication at EOT and the rate of clinical cure at 8 weeks in the overall population and in patients treated with moxifloxacin, but not in those treated with amoxicillin/clavulanic acid. Overall, both treatments were well tolerated and in this elderly population of outpatients, with multiple comorbidities and co-medications, no tendonitis or drug-related hepatic adverse events were reported. MAESTRAL enrolled a cohort of outpatients with Anthonisen type 1 exacerbations of moderate-to-severe COPD and treated them with one of two recommended antibiotics in this patient group; these were moxifloxacin and amoxicillin/clavulanic acid [14, 15]. A large proportion of the patients had risk factors for poor outcomes . A Data Review Committee reviewed all results designated as clinical failures and indeterminate outcomes. Such an approach improves the accuracy and consistency of results . Clinical failure rates at 8 weeks for both therapies were ∼20% in the main analysis populations, similar to that observed in previous studies, which were stratified by disease severity  or used longer-term end-points . As shown by the survival curves, treatment failure rates were low in both treatment arms at EOT; there was a short period of accelerated relapse soon after stopping antibiotic treatment, then a steady relapse rate between 2 and 4 weeks, with a slower decline up to 8 weeks. This indicates that a time period of ≥4 weeks may be more reliable than traditional end-points to assess the differences in efficacy of antibiotic treatment in AECOPD. There were no differences between moxifloxacin and amoxicillin/clavulanic acid in the relapse rate during the 8-week follow-up period in the overall population. However, there were significantly fewer treatment failures in patients with a confirmed bacterial AECOPD when treated with moxifloxacin. The MAESTRAL population was screened to include only patients most likely to have a bacterial AECOPD, and bacterial isolation rates (48%) were comparable to a number of studies looking at similar populations [28, 29]. The pathogen profile in the MAESTRAL study was as expected for this population of elderly patients with underlying moderate-to-very-severe airway obstruction [30, 31]. In terms of bacteriological eradication rates at EOT, moxifloxacin was more effective overall (p<0.03) and against H. influenzae, as would be expected from previous studies . The effectiveness of moxifloxacin in confirmed bacterial AECOPD was not explained by a higher activity against P. aeruginosa, since eradication of this pathogen was similar in the two arms of the study (table 3). The higher bacteriological eradication rates in the moxifloxacin arm may have been responsible for driving the superiority of moxifloxacin at 8 weeks post-therapy in bacteriologically positive patients. A key observation in the MAESTRAL study was that overall, and in the moxifloxacin arm, patients who achieved eradication of the primary pathogen at EOT had significantly higher cure rates at 8 weeks post-therapy versus patients with persistence or superinfection (overall p=0.001, moxifloxacin p=0.003). Although similar results have previously been observed at the EOT in short-term studies , the importance of bacterial eradication in continued clinical cure has not been previously reported. These results underscore the importance of bacterial eradication in preventing relapse [10, 34], and support the hypothesis of continued inflammation caused by persistent infection as an underlying mechanism for relapse and recurrent exacerbations . Although the importance of stratifying patients by oral steroid use to avoid bias in results has been emphasised previously, its application remains relatively rare in antibiotic trials of AECOPD . In the current study, 35% of patients received systemic steroid therapy, a higher number compared with that observed in previous studies (16–21%) [36, 37]. Steroid use was more common in South America and Europe versus Asia/Pacific, probably reflecting different therapeutic practices. The MAESTRAL analysis stratified patients by systemic steroid use, allowing identification of differences in outcomes for steroid versus nonsteroid-treated patients. In both treatment groups, clinical failure rates were higher in steroid- versus nonsteroid-treated patients, as previously observed . The severity of the underlying COPD based on FEV1 measurement at enrolment was greater in the patients who received systemic steroids versus those who did not, and a greater proportion of steroid- versus nonsteroid-treated patients qualified as having very severe COPD. A retrospective analysis of data showed that systemic steroid-treated patients had a longer respiratory history and more breathlessness with tachycardia. Therefore, patients treated with oral steroids had more severe disease, and as a group did less well despite steroid and antibiotic treatment. In patients receiving systemic steroids, there was a trend towards a lower failure rate for moxifloxacin versus amoxicillin/clavulanic acid. During the design of the MAESTRAL study, ethics committees expressed a strongly held view that the option to use steroids must be made available to physicians. While the role of steroids in addition to antibiotics for patients who have been hospitalised due to exacerbations, or who have required emergency room evaluation, is supported by clinical evidence, their use in outpatient settings has not been as systematically investigated [36, 39, 40]. The retrospective analysis described above showed that oral steroids were appropriately prescribed in more serious exacerbations. A number of patient characteristics were associated with pathogen presence at baseline: age ≥65 yrs, no recent antibiotic use and FEV1≥30% pred. However, the differences were small and unlikely to be clinically useful in identifying patients with pathogens. Although the macroscopic appearance of the sputum at baseline was checked against a colour chart for all patients by the investigators, a significant number of sputum samples did not grow any bacteria. Sputum colour, assessed by a colour chart, is a strong predictor of bacterial aetiology of exacerbations; however, its excellent diagnostic yield observed in unicentre studies drops dramatically in multicentre trials, probably due to the subjective assessment despite the colour chart [41–43]. Since approximately half of patients in the present study produced sputum that did not contain bacteria after culturing, it seems likely that a significant proportion of patients had another cause for their exacerbation. While molecular diagnosis of infection  or the use of biomarkers could be used at the point of care to help identify these patients, identification from clinical characteristics alone remains challenging. Choosing the most appropriate antibiotic for an AECOPD patient is dependent on a number of factors including severity of COPD, underlying risk factors for poor outcome (e.g. older age, low FEV1, a high number of previous exacerbations and comorbid conditions ) and previous antibiotic use [13, 14, 45]. Current guidelines differ in their recommendations for antibiotic choice for outpatient AECOPD. While the Global Initiative for Chronic Obstructive Lung Disease (GOLD)  and Canadian Thoracic Society  guidelines use the risk factors described previously to identify complicated patients, and recommend treatment with amoxicillin/clavulanate or fluoroquinolones such as moxifloxacin in these patients, others [13, 45, 46] recommend initial treatment with amoxicillin, tetracycline or doxycycline in all outpatients. Several studies have compared the efficacy of the various antibiotics recommended in clinical guidelines. In the MOSAIC study, which compared moxifloxacin with a basket of comparators (amoxicillin, clarithromycin or cefuroxime), moxifloxacin resulted in superior clinical cure rates overall, as well as higher bacteriological success rates in patients with a confirmed bacterial pathogen . Furthermore, moxifloxacin-treated patients were significantly less likely than those treated with a comparator to experience treatment failure, a new exacerbation or require any further antibiotic treatment within 5 months of the end of treatment. A number of other clinical trials and meta-analyses have also shown improved outcomes for alternative versus first-line treatments [12, 37, 47, 48]. Among these, two studies identified quinolones as effective therapy options in terms of increasing treatment success versus first-line therapies  and reducing relapse rates . The relatively low failure rates (∼20%) in the MAESTRAL study suggest that treatment with broader spectrum drugs, such as moxifloxacin or amoxicillin/clavulanic acid, is appropriate in this group of patients with moderate-to-severe AECOPD managed outside the hospital. As with all clinical studies, there are limitations to the MAESTRAL trial. The study design included stratification by systemic steroid use, but not other respiratory co-medications as this would have significantly increased the complexity of the study. However, as the number of patients receiving respiratory co-medications was well balanced between the moxifloxacin and amoxicillin/clavulanic acid groups, it is unlikely that respiratory co-medications had a disproportionate effect on efficacy outcomes in either treatment arm. The changes recorded by both patient-reported outcome instruments during the study were substantial but did not differentiate between the two antibiotics. While the SGRQ is a widely used tool for measuring health status in patients with COPD, it is designed to measure health status during the stable phase of the disease, rather than during an exacerbation . Therefore, its results must be interpreted with caution . Similarly the AECB-SS questionnaire, which measures symptoms in exacerbations, has not yet been validated. Investigators' decisions regarding failure were considered by the Data Review Committee and this assessment showed that clinical judgment was, at times, variable. We believe that this review process, which, in some cases, involved going back to the investigator with questions, did improve the validity of our results. A further possible limitation is the large number of countries involved in the study, which resulted in only a small number of cases in some countries. Nevertheless, further analysis of the data revealed similar failure rates for countries enrolling either small or large numbers of patients, which suggests no selection bias. The dose of amoxicillin/clavulanic acid used in the current study (875/125 mg b.i.d.) is widely used in many clinical trials. While the 625 mg t.i.d. dose of amoxicillin has a better time above MIC pharmacokinetic/pharmacodynamic profile , there is no established superiority for this dose versus the 875 mg b.i.d. dose administered in the current study. Furthermore, tolerability is greater with b.i.d. than t.i.d. dosing [21, 52]. The MAESTRAL study met its primary end-point with moxifloxacin showing noninferiority to amoxicillin/clavulanic acid. The good efficacy and tolerability of both drugs confirms their position as recommended treatments for exacerbations for outpatients with moderate-to-severe AECOPD with a suspected bacterial aetiology [14, 15, 35]. The strong correlation between bacterial eradication at EOT and continued clinical cure up to 8 weeks past the exacerbation emphasises the importance of antibiotic treatment in AECOPD. The higher bacterial eradication rates in the moxifloxacin arm may explain the superior outcomes in patients with a bacteriologically confirmed infection, suggesting this treatment could be a preferred option in patients where bacterial infection is most likely. These differences were most evident at 4 and 8 weeks post-therapy, indicating that prolonged end-points may be more useful for discerning clinically relevant differences between antibiotics, a factor that should be taken into account in the design of future trials. 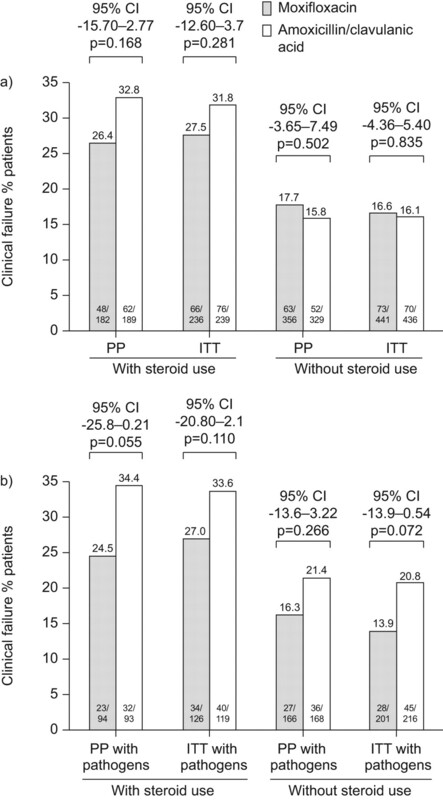 The differences between patients who use and do not use steroids indicate that stratification is an important aspect of trial design and deserves further study. It is hoped that the outcomes of MAESTRAL will lead to further work to define clinical criteria and/or biomarkers to help clinicians identify both the most appropriate patients for antibiotic therapy and the most appropriate antibiotic therapy for individual AECOPD patients. Highfield Communication Consultancy, Oxford, UK, funded by Bayer HealthCare, provided editorial support in the development of this paper. All analyses were carried out by the study sponsor and the Data Review Committee was responsible for validating all clinical failure data. The authors thank G. Faragó (Bayer Inc., Toronto, ON, Canada), study manager, for excellent and dedicated support throughout the trial and R. Kay (RK Statistics Ltd, Bakewell, UK) for independent statistical assessment. They are also grateful to all physicians who enrolled patients in the study; a full list is given in the online supplementary material. For editorial comments see page 1. This study was sponsored by Bayer HealthCare Pharmaceuticals AG, Berlin, Germany. R. Wilson was supported by the NIHR Respiratory Disease Biomedical Research Unit.
. Exacerbations impair quality of life in patients with chronic obstructive pulmonary disease. A 2 year follow-up study. Thorax 2004; 59: 387–395.
. COPD exacerbations. 2: aetiology. Thorax 2006; 61: 250–258.
. Exacerbations of chronic obstructive pulmonary disease. Respir Care 2003; 48: 1204–1213.
. Strategies for improving outcomes of COPD exacerbations. Int J Chron Obstruct Pulmon Dis 2006; 1: 335–342.
. Treatment of acute exacerbations of COPD. Clin Cornerstone 2003; 5: 28–36.
. The impact of severe exacerbations on quality of life and the clinical course of chronic obstructive pulmonary disease. Am J Med 2006; 119: Suppl. 1, S38–S45.
. Antibiotics in acute exacerbations of chronic bronchitis. Expert Rev Anti Infect Ther 2010; 8: 405–417.
. Relationship between exacerbation frequency and lung function decline in chronic obstructive pulmonary disease. Thorax 2002; 57: 847–852.
. Effect of pharmacotherapy on rate of decline of lung function in chronic obstructive pulmonary disease: results from the TORCH study. Am J Respir Crit Care Med 2008; 15: 332–338.
. Resolution of bronchial inflammation is related to bacterial eradication following treatment of exacerbations of chronic bronchitis. Thorax 2003; 58: 680–685.
. Antibiotics in the treatment of acute exacerbations of chronic bronchitis. Expert Opin Investig Drugs 2002; 11: 911–925.
. Macrolides, quinolones and amoxicillin/clavulanate for chronic bronchitis: a meta-analysis. Eur Respir J 2007; 29: 1127–1137.
. Guidelines for the management of adult lower respiratory tract infections. Eur Respir J 2005; 26: 1138–1180.
. Canadian Thoracic Society recommendations for management of chronic obstructive pulmonary disease - 2008 update – highlights for primary care. Can Respir J 2008; 15: Suppl. A, 1A–8A.
. Antibiotic therapy in exacerbations of chronic obstructive pulmonary disease. Ann Intern Med 1987; 106: 196–204. , GLOBE Study Group. Time course of recovery of health status following an infective exacerbation of chronic bronchitis. Thorax 2003; 58: 589–593.
. Temporal clustering of exacerbations in chronic obstructive pulmonary disease. Am J Respir Crit Care Med 2009; 179: 369–374.
. A novel study design for antibiotic trials in acute exacerbations of COPD: MAESTRAL methodology. Int J Chron Obstruct Pulmon Dis 2011; 6: 373–383.
. Short and long-term outcomes of moxifloxacin compared to standard antibiotic treatment in acute exacerbations of chronic bronchitis. Chest 2004; 125: 953–964.
. Dosing of amoxicillin/clavulanate given every 12 hours is as effective as dosing every 8 hours for treatment of lower respiratory tract infection. Clin Infect Dis 1997; 24: 570–574. Clinical Laboratory Standards Institute. CLSI Document MA07-A8, Wayne, CLSI, 2009.
. Antibiotic treatment and factors influencing short and long term outcomes of acute exacerbations of chronic bronchitis. Thorax 2006; 61: 337–342.
. Counting, analysing and reporting exacerbations of COPD in randomised controlled trials. Thorax 2008; 63: 122–128.
. Antibiotics are associated with lower relapse rates in outpatients with acute exacerbations of COPD. Chest 2000; 117: 1345–1352.
. Levofloxacin 500 mg once daily versus cefuroxime 250 mg twice daily in patients with acute exacerbations of chronic obstructive bronchitis: clinical efficacy and exacerbation-free interval. Int J Antimicrob Agents 2007; 30: 52–59.
. Short-course therapy of acute bacterial exacerbation of chronic bronchitis: a double-blind, randomized, multicenter comparison of extended-release versus immediate-release clarithromycin. Curr Med Res Opin 2003; 19: 411–420.
. Indicators of bacterial infection in patients with acute exacerbation of chronic bronchitis for application in clinical trials of antibacterial drugs. J Infect 2007; 55: 226–232.
. Relationship between bacterial flora in sputum and functional impairment in patients with acute exacerbations of COPD. Chest 1999; 116: 40–46.
. The diagnosis and treatment of elderly patients with acute exacerbation of chronic obstructive pulmonary disease and chronic bronchitis. J Am Geriatr Soc 2010; 58: 570–579.
. Moxifloxacin in the management of exacerbations of chronic bronchitis and COPD. Int J Chron Obstruct Pulmon Dis 2007; 2: 191–204.
. Clinical and bacteriological efficacy in treatment of acute exacerbations of chronic bronchitis with cefditoren-pivoxil versus cefuroxime-axetil. Antimicrob Agents Chemother 2006; 50: 1762–1767.
. Clinical significance of the infection-free interval in the management of acute bacterial exacerbations of chronic bronchitis. Chest 2005; 127: 2231–2236.
. Infection in the pathogenesis and course of chronic obstructive pulmonary disease. N Engl J Med 2008; 359: 2355–2365.
. Outpatient oral prednisone after emergency treatment of chronic obstructive pulmonary disease. N Engl J Med 2003; 348: 2618–2625.
. Antibiotics in addition to systemic corticosteroids for acute exacerbations of chronic obstructive pulmonary disease. Am J Respir Crit Care Med 2010; 181: 150–157.
. Antibiotic treatment is associated with reduced risk of a subsequent exacerbation in obstructive lung disease: an historical population based cohort study. Thorax 2008; 63: 968–973.
. Clinical practice. Outpatient management of severe COPD. N Engl J Med 2010; 362: 1407–1416.
. Combined salmeterol and fluticasone in the treatment of chronic obstructive pulmonary disease: a randomised controlled trial. Lancet 2003; 361: 449–456.
. Sputum color as a marker of acute bacterial exacerbations of chronic obstructive pulmonary disease. Respir Med 2005; 99: 742–747.
. Relation of sputum colour to bacterial load in acute exacerbations of COPD. Respir Med 2009; 103: 601–606.
. Relationship of sputum color to nature and outpatient management of acute exacerbations of COPD. Chest 2000; 117: 1638–1645.
. Molecular diagnosis of respiratory tract infection in acute exacerbations of chronic obstructive pulmonary disease. Clin Infect Dis 2011; 52: Suppl. 4, S290–S295.
. Standards for the diagnosis and treatment of patients with COPD: a summary of the ATS/ERS position paper. Eur Respir J 2004; 23: 932–946.
. Diagnosis and management of stable chronic obstructive pulmonary disease: a clinical practice guideline from the American College of Physicians. Ann Intern Med 2007; 147: 633–638.
. Clinical and economic considerations in the treatment of acute exacerbations of chronic bronchitis. J Antimicrob Chemother 1999; 43: Suppl. A, 107–113.
. Comparison of first-line with second-line antibiotics for acute exacerbations of chronic bronchitis: a metaanalysis of randomized controlled trials. Chest 2007; 132: 447–455.
. A self-complete measure of health status for chronic airflow limitation. The St. George's Respiratory Questionnaire. Am Rev Respir Dis 1992; 145: 1321–1327.
. Validity of the St George's respiratory questionnaire at acute exacerbation of chronic bronchitis: comparison with the Nottingham health profile. Qual Life Res 2003; 12: 117–132.
. Development of a twice daily dosing regimen of amoxicillin/clavulanate. Int J Antimicrob Agents 2007; 30: Suppl. 2, S118–S121.
. Introduction: historical perspective and development of amoxicillin/clavulanate. Int J Antimicrob Agents 2007; 30: Suppl. 2, S109–S112.